I’ve been saying things like, “How did you get so big?” lately to my kids. Sometimes I look at them and just wonder where the time has gone, and how it’s even possible that my oldest is starting to look more like a teenager every day. It’s both sobering and exciting. The truth though is it’s taken 12 years for all this change to happen in my son, but I don’t always see the growth every single day until all of the sudden he looks bigger or older. Can you relate? No way, the market isn’t slowing: The same thing happens with real estate. It’s easy to plug away and use all the normal cliches to describe the market, but when we pause to really take a closer look, we begin to notice things are different. Let’s take a deeper look into the numbers below. If you’re local, absorb what is here and feel free to share some of the talking points with your contacts. If you’re out of town, I’d love to hear about your market. Email subscribers, I recommend reading this big monthly post on the blog instead of email. DOWNLOAD 51 graphs HERE (zip file): Please download all graphs in this post (and more) here as a zip file (or send me an email). Use them for study, for your newsletter, or some on your blog. See my sharing policy for 5 ways to share. One Paragraph to Describe the Sacramento Market: The housing market has had an aggressive feel for most of the year. Pending sales have been a good 10-15%+ higher than normal, sales volume in the Sacramento region is up 10% this year, and values have seen a modest seasonal uptick too. Overall the market is still quite competitive in some price ranges because inventory and interest rates are still low, but there have been some subtle changes lately that help us see the market is beginning to slow down. Remember, it is normal for markets to slow, and the past two years have seen a very definitive seasonal market where the Spring is hot and the Fall is soft. For instance, it took 2 days longer to sell a home last month compared with the previous month, price reductions are growing in number, the median price in Sacramento County has been hovering at the same level for 90 days, interest rates have seen a minor increase, and housing inventory has seen a slight uptick. As housing supply presumably continues to increase over the next few months, watch out for more price reductions, unrealistic expectations from sellers, and buyers gaining more power. I’m NOT saying the market is declining. I’m simply saying the strong seasonal market is showing signs of beginning to slow. Those who take notice can make informed real estate decisions and/or help clients price their homes properly (see 3 points below about pricing). The median price has been hovering at $290,000 for 90 days. It took an average of 31 days to sell a house last month (30 in June). Cash sales were 16.7% of all sales in July (very normal level). Short Sales and REOs were only 4% of sales last month. FHA sales were 26.5% of all sales in Sacramento County in July. Sales volume is 8.6% higher so far in 2015 compared to last year. Sales volume was 12% higher in July 2015 compared to July 2014. There is a 1.9 month supply of homes for sale (1.6 in June). The average price per sq ft is 185 (6% higher than last July). The average sales price is $320,732 (slightly lower than previous month). Sales volume was up 14.5% in July 2015 compared to July 2014. Sales volume for the year is up 10.3% compared with 2014. The median price at $330,000 is up 6% from last year, but down 1% from the past two months. Cash sales were 17% of all sales last month (very normal level). It took an average of 35 days to sell a house last month (33 days in June). FHA sales were 23.1% of all sales in the region last month. There is 1.98 months of housing inventory (up from 1.85 in June). The average sales price is $367,775 (6.8% higher than last year, but down slightly from previous month at $370K). It took 5 less days to sell a house this July compared to July 2014. Distressed sales were less than 4% of all sales last month (REOs / Short Sales). The median price in Placer County is $395,000 (it’s been hovering between $391,000 to 401,000 over the past few months). The median price is 4.2% higher than one year ago (July 2014). It took 40 days on average to sell a house last month (4 more days than June, but 5 less days than last year). FHA sales were 18.8% of all sales in Placer County last month. Sales volume was 14% higher this July compared to last July. Sales volume is up 17.8% in 2015 compared to last year. There is 2.17 months of housing inventory (up from 1.88 months in June). The average price per sq ft is is 202 (up from 182 last July). The average sales price is $430,599 (5.4% higher than July 2014, but lower than June). Price according to the most recent listings that are getting into contract rather than the highest sales from the Spring. Remember how price sensitive the market is right now. Despite inventory and interest rates being low, buyers are not biting on overpriced listings. Price according to the neighborhood market rather than county-wide trends. The county-wide market may show increases or declines, but your neighborhood might be more or less aggressive compared to the entire county. If an article is too long, I probably won’t read it. Can you relate? Yet if an article is full of solid information to apply to life or business, I’ll definitely look it over – even if it’s longer. Enter my big monthly post. I hope to highlight the real estate market so you can see it, pick up a few conversation nuggets, and have some images to share too. Take a look below at the latest trends for Sacramento and Placer County. Briefly scan the graphs below. Take several minutes to digest the graphs and commentary. Median Price: The median sales price in Placer County is $366,500 as of April 2014. This is 5% higher than April 2013, but fairly steady from where the market was at in the summer of 2013. As you can see, the market sort of leveled off two quarters ago, and has since been fairly flat with a mild seasonal uptick. Inventory at “Bottom” Levels: Inventory has declined over the past few months (which is normal this time of year). Right now there are 2.5 months worth of houses for sale in Placer County. After spending about 18 months below two months of housing supply, the market is finally back to 2.5 months, which is about where it was when the real estate market bottomed out at the beginning of 2012. Low Volume, but Increasing: Sales volume has been down by 10% or so in Placer County over these past few months, and April 2014 was down by 15% compared to April 2013. This past month did see an increase though, but it’s fairly normal to see an uptick in volume this time of year. Properties spent an average of 50 days on the market to sell in April 2014 compared to 39 days in April 2013. Flattening Market: There are many layers to the real estate market. This graph helps show how median price, inventory and interest rates work together. An increase of interest rates and less investor cash tends to impact prices, right? Sensitivity & 2008 Values: The median price in Sacramento County is $265,000 as of April 2014. This is definitely higher than the summer of 2013 and similar to where the market was at in January 2008. Sacramento County has been showing a seasonal uptick over the past few months (this is normal). Yet at the same time sales volume is low (which makes stats weaker), and the market is very price sensitive. This means if properties are not priced correctly, they are sitting. Homes spent an average of 39 days on the market last month compared with 26 days in April 2013. Some neighborhoods and price ranges are very flat, while other areas feel a bit hotter so to speak. More Price Context: When taking a wider look at Sacramento County, values are currently close to the beginning of 2008 and the end of 2003 (or very beginning of 2004). Keep in mind each neighborhood might have a different price dynamic, so be careful not to project county-wide stats on every neighborhood equally. Sacramento vs. Placer: This is what the median price comparison looks like between Sacramento & Placer County. Good News of More Volume: The past quarter has had very sluggish sales volume, but last month had a healthy increase in sales. Granted, it is fairly normal to see an uptick from March to April, but an increase doesn’t always happen. In fact, 4 our of the last 5 years did not have an increase at all as you can see in this graph. Ultimately it will be interesting to see if the market will have a stronger next quarter to make up for the slower first quarter. This is something to watch carefully. 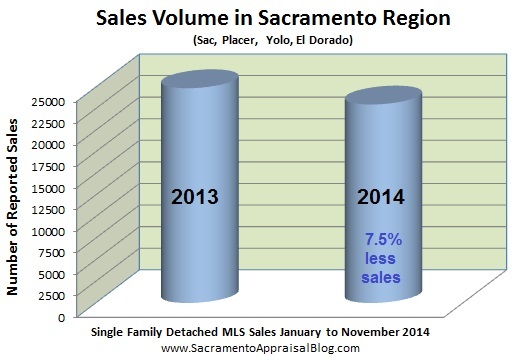 Declining Inventory: As of April 2014 inventory in Sacramento County is about 1.8 months. Trendgraphix says 1.9 months, but it is really 1.82 months to be precise. This is very low and is creating more competition among buyers. You can read 4 reasons why inventory is low for details about how inventory works. Rates & Steroids: Interest rates are almost one percentage point higher than they were than last year, but they are still incredibly low. Keep in mind when rates are this low, they act as a steroid for the market to boost values. The Fed talked about raising rates when unemployment reached 6.5% nationally (it hit that level last month), but now they are backing away from that plan. The housing market and economy may still be too fragile to raise rates, so The Fed will presumably keep rates low for a season to help artificially boost the market or at least try to hold the market from tipping over to experience declines. If interest rates do dip lower for some reason though, it will super-charge the housing market again. We shall see. Upticks: The median price, average sales price, and average price per sq ft have all shown increases over the past few months ranging from 1.7 to 2.3%. Layers at Work: Now that cash investors have backed off significantly in Sacramento County, the market will presumably be more sensitive to what happens with inventory levels as well as the local economy. We often hear that inventory at 5 months is normal, but think of how low inventory is right now, yet how flat the market has seemed. Could the market remain fairly flat if inventory increased from 1.8 months to 5.0 months? April to April: When looking at data, it’s always good to compare what was going on last year at the same time with this year. This helps us see how the market has changed. The Region: Last but not least, here is a glimpse of the Sacramento Region. Inventory is at 2.1 months right now. If you want a deeper picture of inventory, check out The Big & Little Story of Inventory. I hope this was helpful. I sincerely appreciate you being here. Questions: What are you seeing in the trenches of the market? What stands out to you from above? Why is your recent purchase assessed so much higher than the purchase price? I’ve been getting this question quite a bit lately. Home owners wonder sometimes why their assessed value is so much higher than the purchase price. It doesn’t make any sense, right? Well, let me share with you a scenario to explain why this happens sometimes. I spoke with a home owner this week, and his property is currently assessed at $350,000 despite the property being purchased in April 2012 for $200,000. Obviously this is a huge difference, and it’s highly inconvenient too since his tax bill is now $1,500+ higher than expected. Why does this happen? When you purchase a property in the latter part of the first or second quarter of the year in Sacramento County, sometimes the Assessor is not able to reassess your property before the new assessments are published on July 2. This means that even though you purchased at a much lower level (market value presumably), the Assessor’s value is not based on your new purchase because they couldn’t get the new data in the system before assessments were posted. Call the Assessor’s Office to discuss your situation. You’ll most likely be reassessed come October since The Assessor reviews purchases in the beginning of the year to catch errors like this (see points 5 & 6 though). You’ll be issued a refund if you overpaid on your property taxes. Don’t hire anyone to appeal your property taxes until you hear back from the Assessor. Why? Because this scenario above is most likely really just a logistical issue due to the time you purchased your property rather than blatant overassessment. Hopefully your property will be reassessed in October to a level more consistent with your purchase price. However, if the Assessor does think your property is worth the higher amount and you know that’s not the case, then it’s time to appeal. If you don’t hear from the Assessor’s office by mid-October or early November, let’s talk. Do not let the deadline to appeal on November 30, 2012 pass before you do something. If the deadline to appeal does pass though, keep in mind you have four years to appeal your base-year value (This is only for “base year” value situations. Most other property tax scenarios have much less time – only a matter of months). While it can be really frustrating to be in this situation, I hope this was helpful to answer some of your questions. Feel free to contact me if you have any other questions or property tax appeal issues to discuss.